Orion Pictures and BH Tilt have revealed the first clip for The Belko Experiment, from writer/producer James Gunn (Slither, Guardians of the Galaxy) and Wolf Creek director Greg McLean. You can watch The Belko Experiment clip in the player below! Taking its cues from Lord of the Flies and Battle Royale by way of The Hunger Games, the wildly gory The Belko Experiment explores a twisted social experiment, in which a group of 80 Americans are locked in their high-rise corporate office in Bogata, Columbia and ordered by an unknown voice on an intercom system to participate in a deadly game of kill or be killed. 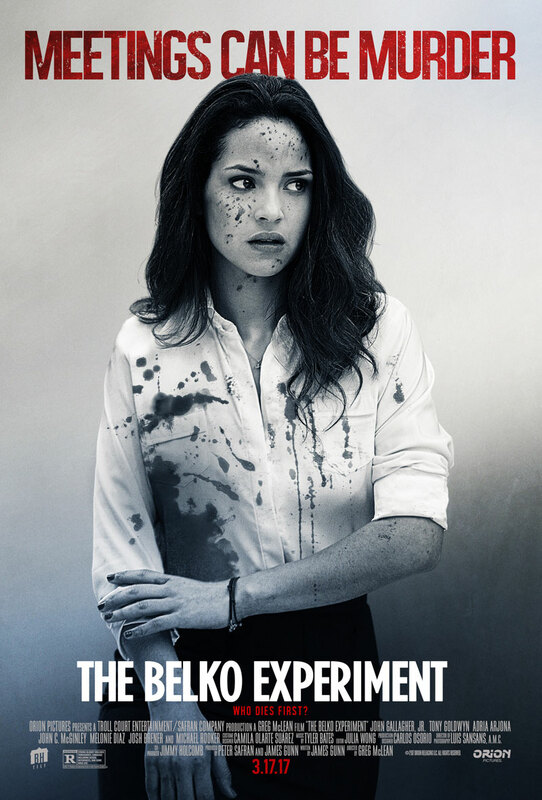 The cast for The Belko Experiment includes John Gallagher Jr. (Short Term 12), Melonie Diaz (Fruitvale Station), John C. McGinley (Office Space), Tony Goldwyn (Scandal), David Dastmalchian (The Dark Knight), Gail Bean (Unexpected), Michael Rooker (Guardians of the Galaxy), Valentine Miele (Super), Sean Gunn (Guardians of the Galaxy), Mikaela Hoover (Super), Josh Brener (Silicon Valley), Rusty Schwimmer (Louie), Joe Fria (Speedwagon), James Earl (The Lazarus Effect), Brent Sexton (The Killing), Stephen Blackehart (Tromeo and Juliet), David Del Rio (Pitch Perfect) and Ben Davis (Red Dead Redemption). RELATED: Listen to an Exclusive Song from The Belko Experiment! The film will debut in theaters on March 17.